After an exciting but exhausting week at Yellowstone I was ready to take it easy for a while. 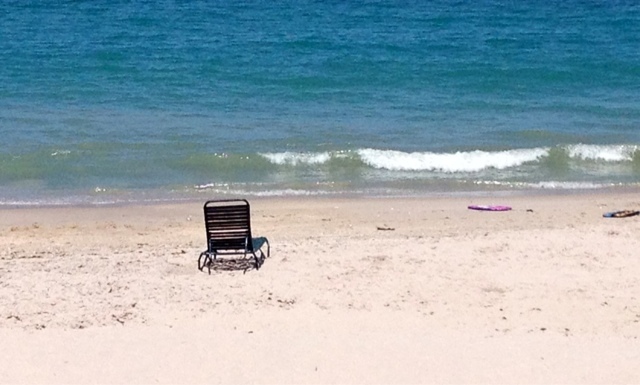 Fortunately the next thing on the agenda was a few days of relaxation in Vero Beach, Florida, where my grandmother has a condo with beach access. I hadn't been to Vero since I was a kid, and I was surprised to find that the sleepy beach town I remembered had transformed into a much more upscale sleepy beach town, the kind of place where frugal multimillionaires shop at consignment stores and order the early bird special. There are more restaurants now, and better ones, and all kinds of dangerous cute little boutiques. I did do some serious shopping while I was there - I spent a small fortune at the outlet mall - but mostly I spent long, leisurely hours at the beach: reading in the sunshine, watching the waves roll in, going for long walks along the shore, ogling the diver boys out looking for shipwrecked treasure, immersing myself in aquamarine. I strolled the boardwalk at night with an ice cream cone, hoping to glimpse a sea turtle coming up to lay her eggs. I never did catch a turtle but the nests were everywhere, each neatly roped off, catalogued, and labeled by the Fish and Wildlife Commission. I ate delicious meals with my mother and grandmother, reminiscing and gossiping about real estate. It was just what I needed. fun stuff! What is your schedule like until you get deployed again? Vacation is pretty much over. I go to DC this week for meetings and last-minute administrative stuff, and then I'll be in Dublin by the end of the month. Come visit!